Now that Halloween is just a fortnight away, Microgaming has released a slot that will start introducing the spooks in your body. Inspired by and designed after Halloween film by John Carpenter from 1978, this mobile slot brings back all the terror in spectacular fashion. Microgaming brings the full dose of horror to you in two ways – its theme and gameplay. All the characters from the movie can be found in this game, namely Lynda, Annie, Loomis and Laurie among others. The character that you should truly be afraid of is Michael. Get him in your bonus features and your wins will be halved. We’re not even kidding. Now that you have read that, are you terrified yet? All the action and horror in this game happens on five reels and 50 paylines. You may start playing this game from a mere 50p, but go all the way up to a staggering £200 per spin. Given this massive wagering rage, we are sure that this game will fit both casual players and slots enthusiasts just the same. In fact, we think that players, who are here to bet big, will have experience twice the amount of thrills. As you did expect from a game made after a horror film, Halloween has a dark and menacing feel to it, and it's most prevalent in the design of the reels. Symbol-wise, you will find the same characters from the movie on top of a variety of masks and weapons. The symbol that pays highest will be Laurie and if you are lucky enough to get five of them on a winning payline, you might be walking home with 10x your spin wager. Microgaming has set the variance of Halloween at medium to high. Payouts are less frequent in this game, but when they do come, it pretty much rains money. Halloween is not a slot for the faint-hearted or for those with little patience. There is a chance that you may have to endure a long non-winning streak before you win back your money. The Return to Player (RTP) rate stands at a healthy 96%, making it very possible to maintain your bank balance. In this game, patience is truly a virtue. Graphics and the soundtrack in this slot is very much in line with the movie, with many visual elements being brought into this game with minimal modifications. Truth be told, it is the animations in this game that make all the difference. It is especially prevalent in the bonus features and helps with the execution of the spooky theme greatly. Even with the sophisticated Wandering Reels that are always moving across your reels, the game works as smoothly as it can get on all devices that we tested it on. For those of you wondering, this game is compatible with PC’s, tablets and mobile phones regardless of the platform that your device is running on. In total, there are three bonus features in this game. First are the Wilds. 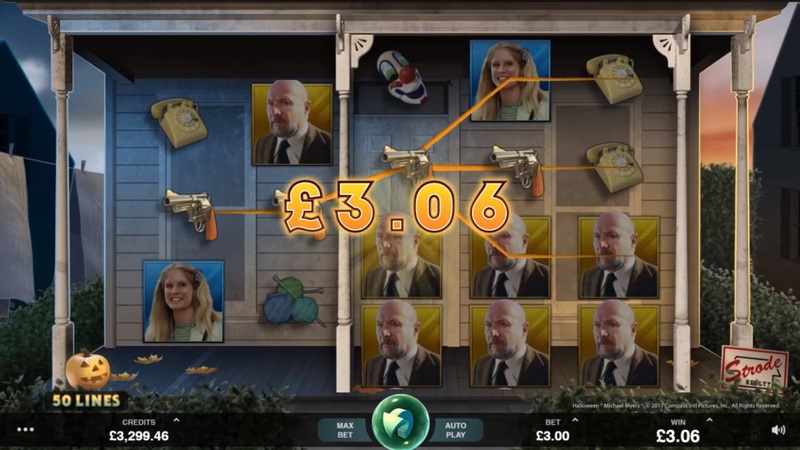 In this game, the Wild symbols come in the form of the Halloween slot logo and it will replace all other symbols except the scatters to complete winning paylines. Good thing is, the Wild symbols come by quite often in the base game. The first major bonus feature in this game is the Wandering Reel. Essentially, it is three reels that spins together. At any point of time, the three reels that are ‘wandering’ will be in a special frame on your reels, so you will know which ones are part of the feature. Each reel that is part of the Wandering Reel stands four symbols high instead of just three. This is where things get interesting – you may get Jumbo Blocks in your wandering reels. Basically, Jumbo Blocks are massive symbols (4x3) that cover your whole Wandering reels. Since the same symbol covers almost two thirds your entire reels, your chances of winning big are very high. On average, you can be expecting wins in the range of 10x to 30x from this bonus feature. The final feature in Halloween is the Trick or Treat Wheel Bonus Feature. To trigger this feature, you will need a minimum of three wheel symbols anywhere on your reels. Having done that, you will be given a chance to spin a wheel of fortune that will determine what you get. Prizes that you can win here include the Boogeyman Bonus, Extra Spins and instant cash prizes. The details of the Boogeyman Feature and the extra spins are as follows. Boogeyman bonus feature – you will be shown an assortment of leaves from which you can pick from. Each leaf contains cash prizes and a win multiplier. It’s not as simple as it seems though, because after every win, your win multiplier will be raised by 1x, yet if you find Michael, you winnings will be halved and the feature will end. The only way to stop Michael from ending your feature is by getting a knife symbol. Extra Spins – You will be awarded nine extra spins, with increased chances of getting the Jumbo Blocks. Halloween — You Can Run, But You Can't Hide! The Boogeyman Feature that you trigger via the Trick or Treat Wheel is by far the best feature in this game. Not only does it pay big time when you are able to get consecutive wins, it also embodies the true spirit of Halloween. In true Halloween fashion, you will slowly walk down a flight of stairs as you pick on leaves. This is where the suspense is at its peak. At any time Michael may appear and destroy half the money that you have won. On the other hand, if you had a knife, you would be able to save yourself and your wallet from him. As a cherry on the top of the cake, Microgaming has even decided to add some win multipliers every time you win. Frankly, the Boogeyman feature is one the best features we have played in a mobile slot. The Halloween mobile slot is an absolute terror and a game that will fit in the Halloween mood perfectly! Halloween Halloween by Microgaming is a spectacular slot and we recommend each and every one of our players to give it a go. It really is that good! Whilst the medium to high volatility of this game may put some people off, we still think that the theme and the bonus features in this game more than compensate for the infrequent payouts. Better still, if you are a player with patience and don’t mind tanking some non-winning streaks before hitting the big wins. In our opinion, Microgaming has taken a well-known brand and has made it a whole lot better. The timing of the release of this title couldn’t have been more perfect too. Happy Halloween to everyone!